a principle that generally recommends, when faced with competing hypotheses that are equal in other respects, selecting the one that makes the fewest new assumptions. This is the way I like to do my research: I pray and then I start digging into the Scriptures. After that, and sometimes during that process, I look at other resources as well. Of all the resources that I am aware of, no one has done more research and provided more resources than Steve Quayle. At least as far as I am concerned, he's the master when it comes to documenting the giants of Genesis 6, of history and of today. A while back, one of my friends gave me Steve's book, The Genesis 6 Giants. I had been tempted to use it for this research, but intentionally withheld myself from doing so. I wanted the Holy Spirit to guide me on my own quest for answers first. After completing this chapter blog, I then felt released to crack that amazing book open. When I did, I found some added insights and some things I disagreed with. Therefore, I have decided to incorporate some of my findings from his book into this work. The paragraph I am writing now and any subsequent references to Mr. Quayle's book are late additions to this chapter blog. 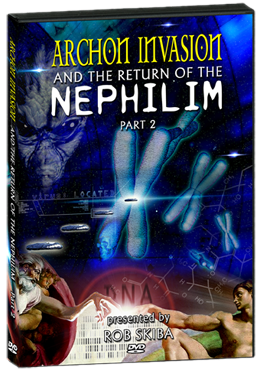 In order to deal with the Return of the Nephilim in Biblical times, I'm going to handle the Post-Flood scenario by dividing this section into three chapters; each looking at the issue from a different perspective, with a fourth chapter giving a perspective that will take the various concepts and ideas of the previous three chapters into consideration with an aim toward describing what may be happen in the days to come. In the Multiple Incursions? 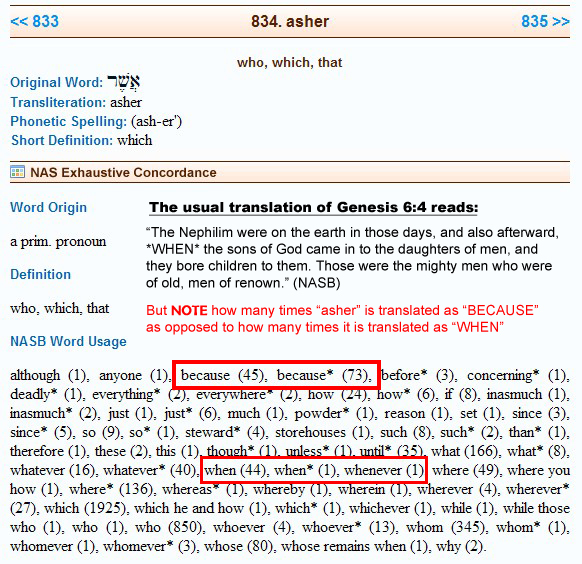 blog, we learned that the Hebrew word "asher" that is translated in the above rendering as "when" is more often translated (in the NASB anyway) as "because." We also learned that the same word "asher" is used again in that passage as "who," which appears to be its most common rendering in the NASB as seen above. Thus, to hang an entire concept, theory, doctrine or idea on that one word and one sentence of Scripture is foolish and hardly a firm foundation to stand on. And Seth lived one hundred and five years, and he begat a son; and Seth called the name of his son Enosh, saying, Because in that time the sons of men began to multiply, and to afflict their souls and hearts by transgressing and rebelling against God. And it was in the days of Enosh that the sons of men continued to rebel and transgress against God, to increase the anger of the Lord against the sons of men. And the sons of men went and they served other gods, and they forgot the Lord who had created them in the earth: and in those days the sons of men made images of brass and iron, wood and stone, and they bowed down and served them. And every man made his god and they bowed down to them, and the sons of men forsook the Lord all the days of Enosh and his children; and the anger of the Lord was kindled on account of their works and abominations which they did in the earth. And the Lord caused the waters of the river Gihon to overwhelm them, and he destroyed and consumed them, and he destroyed the third part of the earth, and notwithstanding this, the sons of men did not turn from their evil ways, and their hands were yet extended to do evil in the sight of the Lord. And in those days there was neither sowing nor reaping in the earth; and there was no food for the sons of men and the famine was very great in those days. And the seed which they sowed in those days in the ground became thorns, thistles and briers; for from the days of Adam was this declaration concerning the earth, of the curse of God, which he cursed the earth, on account of the sin which Adam sinned before the Lord. And it was when men continued to rebel and transgress against God, and to corrupt their ways, that the earth also became corrupt. And Seth had a son, and he called his name Enos: he hoped to call on the name of the Lord God. The verb " anash," meaning to be desperate, woeful, very sick (2 Samuel 12:15, Jeremiah 17:9). HAW Theological Wordbook of the Old Testament notes on this verb, "most frequently it is used to describe a wound or pain which is incurable...(Jeremiah 15:18, 30:12)" This may shed some light on the enigmatic Beast From The Sea and the fatal wound of which it was healed - Rev 13:3; if not the healing caused by the Christ - Matthew 8:17/ Isaiah 53:4). Then began men to call upon the name of the Lord - The marginal reading is, Then began men to call themselves by the name of the Lord; which words are supposed to signify that in the time of Enos the true followers of God began to distinguish themselves, and to be distinguished by others, by the appellation of sons of God; those of the other branch of Adam's family, among whom the Divine worship was not observed, being distinguished by the name, children of men. It must not be dissembled that many eminent men have contended that " huchal," which we translate began, should be rendered began profanely, or then profanation began, and from this time they date the origin of idolatry. Most of the Jewish doctors were of this opinion, and Maimonides has discussed it at some length in his Treatise on Idolatry; as this piece is curious, and gives the most probable account of the origin and progress of idolatry, I shall insert it here. "In the days of Enos the sons of Adam erred with great error, and the counsel of the wise men of that age became brutish, and Enos himself was (one) of them that erred; and their error was this: they said, Forasmuch as God hath created these stars and spheres to govern the world, and set them on high, and imparted honor unto them, and they are ministers that minister before him; it is meet that men should laud, and glorify, and give them honor. For this is the will of God, that we magnify and honor whomsoever he magnifieth and honoureth; even as a king would have them honored that stand before him, and this is the honor of the king himself. When this thing was come up into their hearts they began to build temples unto the stars, and to offer sacrifice unto them, and to laud and glorify them with words, and to worship before them, that they might in their evil opinion obtain favor of the Creator; and this was the root of idolatry, etc. And in process of time there stood up false prophets among the sons of Adam, which said that God had commanded and said unto them, Worship such a star, or all the stars, and do sacrifice unto them thus and thus; and build a temple for it, and make an image of it, that all the people, women, and children may worship it. And the false prophet showed them the image which he had feigned out of his own heart, and said it was the image of such a star, which was made known unto him by prophecy. And they began after this manner to make images in temples, and under trees, and on tops of mountains and hills, and assembled together and worshipped them, etc. And this thing was spread through all the world, to serve images with services different one from another, and to sacrifice unto and worship them. So, in process of time, the glorious and fearful name (of God) was forgotten out of the mouth of all living, and out of their knowledge, and they acknowledged him not. And there was found no people on the earth that knew aught, save images of wood and stone, and temples of stone, which they had been trained up from their childhood to worship and serve, and to swear by their names. And the wise men that were among them, as the priests and such like, thought there was no God save the stars and spheres, for whose sake and in whose likeness they had made these images; but as for the Rock everlasting, there was no man that acknowledged him or knew him save a few persons in the world, as Enoch, Methuselah, Noah, Sham, and Heber. And in this way did the world walk and converse till that pillar of the world, Abraham our father, was born." - Maim. in Mishn, and Ainsworth in loco. And Cush begat Nimrod: he began [chalal] to be a mighty one [gibborim] in the earth. And Seth had a son, and he called his name Enos: because men began to profane and defile the name of YHVH. The days of Enosh were not good, but rather rebellious. But it is not my intent to say whether or not Enosh participated in that rebellion himself. That is not the point I'm trying to make. The point is, this text is usually used to justify the "godly line of Seth," which is typically (erroneously) associated with "the sons of God" in Genesis 6:4 as opposed to the "ungodly line of Cain," which is referred to as "the daughters of men" in that same passage. Proponents of the "Sethite Theory" will point to Genesis 4:26 and say, "See the sons of Seth are worshipping (calling upon) the name of the Lord." Clearly that is not what was happening there. It does not say that the sons of Seth are calling upon the Lord, it says that "men" began to. But as we've seen above, this "calling on the name of the Lord" is more of a blasphemy - an act of profaning rather than an act of worship anyway. So the "Sethite Theory" completely falls apart under the weight of the above evidence! Perhaps there was repentance by the time God judged this rebellion and Enosh had his son, whom he named, Kenan, which means "sorrow." I don't know. 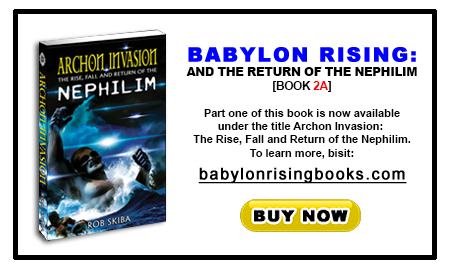 But this Pre-Flood, Gihon river flood is very interesting and we will deal with it in a future volume of this Babylon Rising series in a chapter blog called, "The Yahuwah Triangle" (coming soon). At any rate, God sent a warning flood. This may have been the deluge that sunk Atlantis. I believe it is what caused the depression we now call the Mediterrainian Sea, which may have been one third of the land of Eden. Again, I will address these ideas further in later volumes. I just want to show you some interesting things in the timeline that led up to the Flood. Not too long after this initial judgement of ungodly men, we see The Genesis Six Experiment take place. 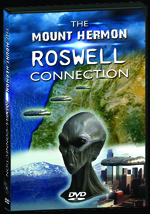 As we've already learned, 200 Watcher class angels landed on Mount Hermon in the days of Jared. 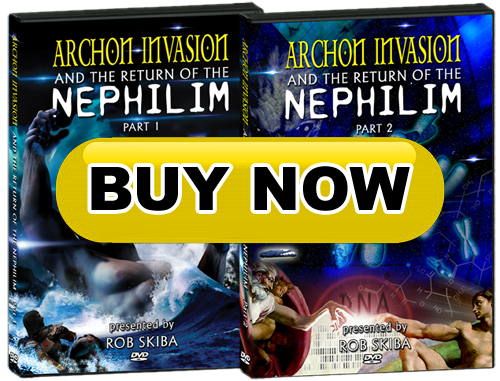 They mated with women, who produced massive offspring known as the Nephilim. Those wicked creatures killed each other off within 500 years, then their parents, the Watchers were judged. Enoch continued to preach righteousness and was raptured. A time of peace followed and Noah was so named for that reason. 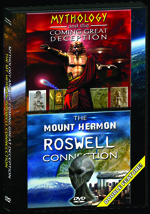 Then, as we learned in the last chapter blog, in the latter days of Methuselah, a total corruption of all flesh took place as a result of the genetic experiments that the "judges and rulers" of the people were doing involving the mixture of species. That caused God to become so angry and hurt that He had to completely destroy His previously stated, "very good" Creation. Only those who made it onto the Ark survived. In the Multiple Incursions? blog, I gave a number of reasons for why I do not subscribe to the idea that there were any more sexual encounters between Fallen Angels and women. Some have challenged my position and have asked, "Who are you to say what angels can and can not do?" It is not what I say that matters, it's what do the ancient Hebrew texts (including the Bible) say - or better yet, what do they not say - that matters. For starters, you will never again see any other reference in the canon of Scripture to angels mating with humans apart from what I consider to be a faulty reading/interpretation of Genesis 6:4. Scripture will always self authenticate, confirm and interpret itself. That is the hallmark of the Bible that makes it so unique among all other ancient (and even modern) texts. Those who hold to the "Multiple Incursions" theory sadly have no further confirming Scriptures to support their theory and must therefore rely on pure speculation and assumption as they move forward in the text. Furthermore, as seen in the previous chapter blog, the entire notion of the "and also after that" of Genesis 6:4 really appears - in context - to be a reference to the PRE-Flood world anyway! This only compounds the problem for my detractors. After the Flood, we see that Noah's sons began to have offspring. Remember, if the Holy Spirit inspired the authors to give added details about an individual, there's a reason for it. Why does the Holy Spirit inspire Moses to give that added detail? Especially when we consider that the "Table of Nations" is about to be given to us in the next chapter? One could argue that this is done as a set up for the next few verses that deal with the strange "incident" in Noah's tent. OK. But that is indeed a strange incident because the culprit in the story appears to be Ham, and yet whatever happened there was somehow directly linked to Canaan! And Ham, the father of Canaan, saw the nakedness of his father, and told his two brethren without. And Shem and Japheth took a garment, and laid it upon both their shoulders, and went backward, and covered the nakedness of their father; and their faces were backward, and they saw not their father's nakedness. And Noah awoke from his wine, and knew what his younger son had done unto him. I already gave my theory about what I thought may have been going on with Noah and his grandson in The Genesis Six Experiment and Building a Pure Nation blogs, so I won't insert that here. Plus, I have to admit that theory is based on pure speculation on my part and in this Strict Canon of Scripture Perspective section I have limited myself to sticking only to the canon and useful Biblical commentary. Thus, using only the Bible, we have no clue what was really going on there in Noah's tent concerning Ham and Canaan, so it's anyone's guess given that limitation. Therefore, let us move on to the next chapter of Genesis. And Cush begat Nimrod: he began to be a mighty one in the earth. He was a mighty hunter before the LORD: wherefore it is said, Even as Nimrod the mighty hunter before the LORD. And the beginning of his kingdom was Babel, and Erech, and Accad, and Calneh, in the land of Shinar. Out of that land went forth Asshur, and builded Nineveh, and the city Rehoboth, and Calah, And Resen between Nineveh and Calah: the same is a great city. Nimrod began to become a giant hunter - or a hunter of giants (using the other definitions of chalal as in "to wound" or "pierce"). And Chus begot Nebrod: he began to be a giant upon the earth. He was a giant hunter before the Lord God; therefore they say, As Nebrod the giant hunter before the Lord. After the flood, when Nimrod reigned over Lebanon, he sent giants to rebuild the fortress of Baalbek, which was so named in honour of Baal, the god of the Moabites and worshippers of the Sun. Based on the Hebrew wording of Genesis 10 and the abundance of external evidence that seems to support our thesis here, I believe it is safe to say that Nimrod was indeed a giant and that he was a subdoer of giants as well. If that's true, then we've just found evidence of giants within a hundred years of the Flood! And we did so with absolutely no references anywhere in Scripture to angels being the cause. 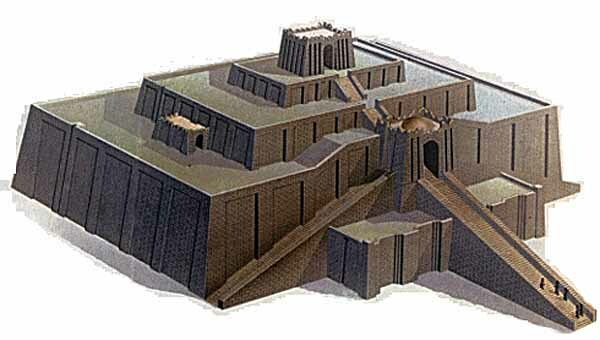 Considering the massive foundation stones and structures found at Baalbek, the most logical conclusion is that giants must have cut, moved and built them. For the sake of illustration, I have created this image in PhotoShop showing how big two 36 foot giants would be as compared to a 6 foot man standing on one of those massive blocks of stone. I personally believe that the giants of that day were even bigger, but even at just 36 feet tall, we can see how easily those stones could have been cut and moved into place by such massive people. And the Biblical evidence appears to suggest that Nimrod may have been their task master! We move on from the introduction of Nimrod in Genesis 10 to learn about Mitzraim's sons. Again, the author pauses to give us added detail about one son: Caphtor. This one is a bit tricky though - depending on the English translation you use. And Pathrusim, and Casluhim (out of whom came the Philistines,) and Caphtorim. And Pathrusim and Casluhim and Caphtorim, from whom came the Philistines. Because of the day that cometh to spoil all the Philistines, and to cut off from Tyrus and Zidon every helper that remaineth: for the LORD will spoil the Philistines, the remnant of the country of Caphtor. That seems pretty cut and dry to me. Therefore, the NLT looks like a better translation, as it is the most consistent with other confirming Scriptures. Caphtor was the father of the Philistines - a group of people we later learn had giants within their midst. Note also that many commentators and Bible translators associate the land of Caphtor with the island of Crete. Keep this in mind when we get into The Other Ancient Cultures Perspective section (coming soon). Canaan’s oldest son was Sidon, the ancestor of the Sidonians. Canaan was also the ancestor of the Hittites, Jebusites, Amorites, Girgashites, Hivites, Arkites, Sinites, Arvadites, Zemarites, and Hamathites. The Canaanite clans eventually spread out, and the territory of Canaan extended from Sidon in the north to Gerar and Gaza in the south, and east as far as Sodom, Gomorrah, Admah, and Zeboiim, near Lasha. Pay attention to that section of the "Table of Nations." The names given there will show up again and again later in the canon of Scripture - especially the Canaanites, Hittites, Jebusites, Hivites and Amorites. 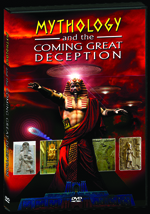 These tribes were apparently loaded with Nephilim genes that God (working through His people) would later wipe out. So, we may have to keep that list handy! Aner: "a lamp swept away"
These three are early descendants of Canaan's son Amorreus, from whom came all of the Amorites. We'll see much more of the sons of Amorreus as we move forward in the text. 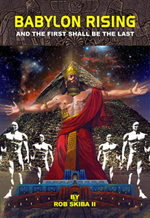 And since, of all the sons of Canaan, the Amorites are so prominent in the Scriptures, we will use them to construct a Post-Flood timeline showing very clearly that the Bible gives us a direct lineage of giants going straight back to the Flood and progressing forward all the way to the time of David. By the end of this blog, you will see that the whole idea of "Multiple Incursions" is both un-Biblical and completely unnecessary in determining how the giants returned after the Flood of Noah. And unto Eber were born two sons: the name of one was Peleg; for in his days was the earth divided; and his brother's name was Joktan. This verse is interesting for a number of reasons. First of all, it tells us when the "division of languages" took place, which gives us a time marker for the Tower of Babel. Based on the ages of the patriarchs given in Genesis 11 and the timelines that can be drawn using those ages, most scholars place the time of the Tower of Babel and the division of languanges at approximately 100 to 150 (MAX) years after the Flood. Second, the Hebrew name Peleg is the same as the Hebrew word "peleg" which means "earthquake" or "violent separation" and caries with it the concept of water (rivers, streams, canals, channels, etc). So, there appears to have been more going on in his days than a simple split up of people groups. I believe there was some sort of massive continental plate shifting going on in his days. Why? Well, because you don't name your kid, "violent seperation by earthquake and water" unless something major happened to make you want to do so! And his brother's name was Joktan, which comes from the word "qaton," which means "to be made small" or "to diminish from something larger." Based on the meanings of those names, we can conclude that in the days of Eber's offspring, the world was indeed divided! And that division happened not long after the Flood. 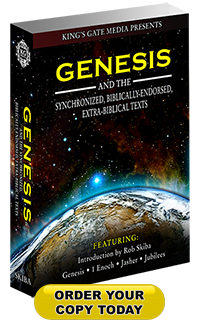 Genesis 11 is a powerhouse of information! It tells us about the building of the Tower of Babel and how the "whole earth" (as in all of the generations of Noah's offspring) were together in one place. Whatever they were planning to do did not please God and so He divided the languages (and apparently the continents too!). Moses then lays out the lineage from Shem to Abram, giving us an easy to track timeline. I want to explore that timeline a bit more here. To aide us in doing so, I have prepared a chart, showing ages from Adam to Abraham, with extended graphics to include the Exodus and the Israelite's entry into the Promised Land. 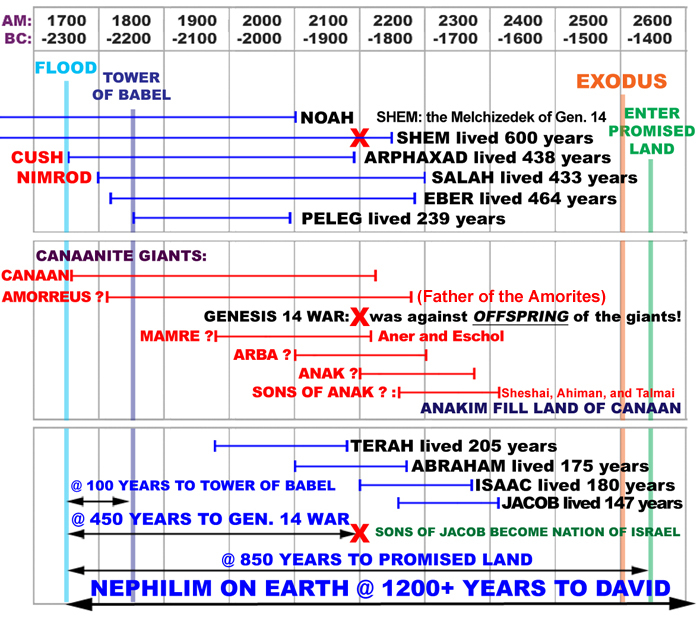 Looking at this chart, we can see that the Nephilim were on the earth for about 1,200 years leading up to the Flood and they were on the earth for about the same amount of time after the flood as well! Contrary to the views of some who adhere to the "Multiple Incursions" theory and suppose the giants just seem to "pop up out of nowhere" in the Biblical text, I believe the canon of Scripture reveals a steady lineage of giants on the earth right from the end of the Flood to the time of David and I intend to prove that fact here. I believe the correct interpretation of "gibbor" in his case is to be thought of as "giant" for the same reason it is in Genesis 6:4, Job 16:14 and 1 Samuel 17:51 and by virtue of the fact that Moses uses the word three times in those two verses. He certainly seems to be stressing the point! But I believe there is something else going on here concerning Cush. Remember, parents name their children what they name them for a reason. Though the text does not explicitly say so, it appears that Cush named his son, Nimrod. If this is true, then essentially what we have here is Cush being the one who declared through the naming of his son, that "We shall rebel." And in the next blog, we will get some very interesting insights from some extra-Biblical, Hebrew texts as to why this may have been so. If the Tower of Babel incident took place less than 150 years after the Flood, presumably Nimrod had to have been old enough to have orchestrated the whole affair. The Bible does not record the time of his birth, but it appears to me that he was probably born 30 to 50 years prior to the construction of that tower (and city). Again, we can explore his birth further in the section that looks at extra-Biblical, Hebrew texts. Regardless, at some point approximately 50 years or so after the Flood, Nimrod was born and soon began to become a giant. If the other stories that we learned about earlier concerning Baalbek are true, the other giants had to have been born about the same time. And I believe the Biblical texts show that they were. In fact, as a son of Canaan, Amorreus would have been a direct, contemporary cousin to Nimrod. Amorreus was the father of the Amorite giants. Back in Genesis 10, Moses then drew our attention to Nimrod's uncle Mitzraim. As a side note, I find it interesting that Mitzraim and all of his children are listed with the Hebrew suffix "im" which is the masculine plural suffix for a word. Was Mitzraim a twin? Were all of his sons twins as well? I don't know. Whatever the case may be, Nimrod's other cousin, Caphtorim is here revealed as the father of a group of people we later discover had giants within their midst, namely Goliath and his brothers who were "the sons of a giant in Gath." And it came to pass after this, that there arose war at Gezer with the Philistines; at which time Sibbechai the Hushathite slew Sippai, that was of the children of the giant: and they were subdued. And there was war again with the Philistines; and Elhanan the son of Jair slew Lahmi the brother of Goliath the Gittite [note: a Gittite is someone who comes from the city of Gath], whose spear staff was like a weaver's beam. And yet again there was war at Gath, where was a man of great stature, whose fingers and toes were four and twenty, six on each hand, and six on each foot and he also was the son of the giant. But when he defied Israel, Jonathan the son of Shimea David's brother slew him. These were born unto the giant in Gath; and they fell by the hand of David, and by the hand of his servants. IMPORTANT NOTE: You will begin to see a pattern in ALL Post-Flood references to giants: they are ALWAYS going to be referred to as sons of other giants - as opposed to being referred to as the offspring of the sons of God like those Nephilim giants who were born as a result of The Genesis Six Experiment. This is not an assumption. It is a fact of Scripture well worth noting. In the Table of Nations, Moses also revealed Nimrod's other cousins from the house of Canaan - a group of people God seems unusually hostile toward (unless you recon them among the Nephilim). If Canaan was the father of all of these "ites," then there were indeed a great deal of giant cousins for Nimrod to rule over! Presumably, in order for them to have been born from women, they must have started out as normal sized humans and grew larger from there. This may be possible simply by virtue of eliminating or turning off the growth inhibitor genes through the hybridization process. I will explain this in greater detail in the final chapter of this Return of the Nephilim volume. If that theory is true, then they would have all "grown up" together. At some point in that process, Nimrod must have risen to a prominent position of power, authority and respect - even amongst those who may have later outgrown him in stature - in order for him to have been the ruler of this emerging world of giants. Regardless of that speculation, the Bibilical text indicates that Nimrod was a giant... and so were pretty much all of his cousins - at least from the lineage of Canaan anyway. Abram traveled through the land as far as Shechem. There he set up camp beside the oak of Moreh. At that time, the area was inhabited by Canaanites. Here Moses tells us that the land was already inhabited by Canaanites. And Moreh may have been one of them. As we will soon see, the (Amorite) giants are often compared with both the cedar tree (in height) and the oaks (in strength). Furthermore, the giants seemed to really like being amongst those trees. Both Moreh and Mamre were owners of oak groves. Moreh's name means, "teacher" and "former rain." I'm not entirely sure what, if any significance there is in that, but the Holy Spirit draws our attention to him and his oaks a few times in the Scriptures, so I suspect that there's probably something to be gleaned from that fact. Regardless, during those short 350 years following the Flood, Canaan's children began to settle, multiply and fill the land that would bear his name. Keep in mind that those early generations lived between 200 and 500 years of age. So, although they did indeed multiply, we aren't necessarily talking about multiple generations. There were likely generations living in the land who were the immediate sons and grandsons of Ham. After all, Shem was still alive at that time (serving as the Melchizedek  of Genesis 14) and living in the land as well. We'll see him in that capacity in Genesis 14. The Perizzites and Canaanites are often mentioned together in the Scriptures. Genesis 13:7 suggests that they lived together near Bethel and Ai. In Joshua 11:3, we see that they dwelt with the Jebusites in the hill country. And later in Joshua 17:5, we see that the tribe of Joseph took the land of the Rephaim and Perizzites. The tribes of Judah and Simeon attacked and defeated the Perizzites and Canaanites to take the territory of Judah, capturing King Adonibezek and cutting off his thumbs and toes. They were also among those who were still left in the land by the time of Ezra's (Ezra 9:1). So they shall no more sacrifice their sacrifices to goat demons [Hebrew: "sa'iyr" or satyrs], after whom they whore. This shall be a statute forever for them throughout their generations. He set up priests of his own for the high places, for the satyrs and for the calves which he had made. But wild beasts of the desert shall lie there; and their houses shall be full of doleful creatures; and owls shall dwell there, and satyrs shall dance there. And the wild beasts of the islands shall cry in their desolate houses, and dragons in their pleasant palaces: and her time is near to come, and her days shall not be prolonged. But wild beasts shall rest there; and the houses shall be filled with howling; and monsters shall rest there, and devils shall dance there, and satyrs shall dwell there; and hedgehogs shall make their nests in their houses. It will come soon, and will not tarry. Yes, the Bible has a lot of very interesting things in it! In fact, the more I dig, the more I find that the truth is far stranger than fiction - and often what we think of as myth or fiction is proven to be true. Thus, when considering Scriptures such as those listed above, I can not help but suspect that Gill was on to something when he described the Perizzites as "rough and inhuman." We'll deal with that more in the next blog. By the end of Genesis 13, Abram moves his camp to Hebron - a city we later discover (in Genesis 23 and elsewhere) was for some time named Kiriath-Arba (the city of Arba - who was the massive, giant ancestor of the Anakim). This is where things get very interesting. An event occurs in the next chapter that I'm going to refer to as The Genesis 14 War. And it came to pass in the days of Amraphel king of Shinar, Arioch king of Ellasar, Chedorlaomer king of Elam, and Tidal king of nations; That these made war with Bera king of Sodom, and with Birsha king of Gomorrah, Shinab king of Admah, and Shemeber king of Zeboiim, and the king of Bela, which is Zoar. All these were joined together in the vale of Siddim, which is the salt sea. Twelve years they served Chedorlaomer, and in the thirteenth year they rebelled. The on-line Jewish Encyclopedia makes mention of the identity of king Amraphel of Shinar, stating that this was Nimrod. - Targum pseudo-Jonathan to Gen. xiv. 1; Gen. R. xlii. 5; Cant. R. viii. 8. Shlomo Yitzhak, also known as the great Torah scholar, "Rashi" agrees - as do a variety of other ancient commentators. So by many accounts, here we have the first Biblical reappearance of Nimrod after the Tower of Babel. According to Jackson's, Dictionary of Scripture and Proper Names (pg. 8), the name Amraphel means: "a sayer of darkness." This dark sayer is going to be joined in battle by a king named Arioch, whose name means "lion-like" (pg. 10). Considering the 1 Chronicles 11:22 Scripture we just looked at above, I have to wonder if Arioch is a predecessor to and an ancient king of the "lionlike men" of Moab! Could be. At any rate, Amraphel and Arioch are joined by another named Chedorlaomer, whose name means, "binding for a sheaf" (pg. 22) and Tidal whose name means, "you shall be cast out from above" (pg. 93). Clearly, this is a motley crew of very dark (Nephilim?) characters. And as we will see in Mose's account of The Genesis 14 War, Nimrod and his evil gang were victorious over the offspring of other giants! In addition to the new names seen above, notice where the opposing army of kings came from: Sodom, Gomorrah, Admah, Zoboiim and Bela. With the exception of Bela (Zoar - a "tiny town"), these are all areas settled by the children of Canaan. Thus, this entire hoard of giants are all descendents of Noah's grandson! Again... there are no Fallen Angels anywhere in this picture. 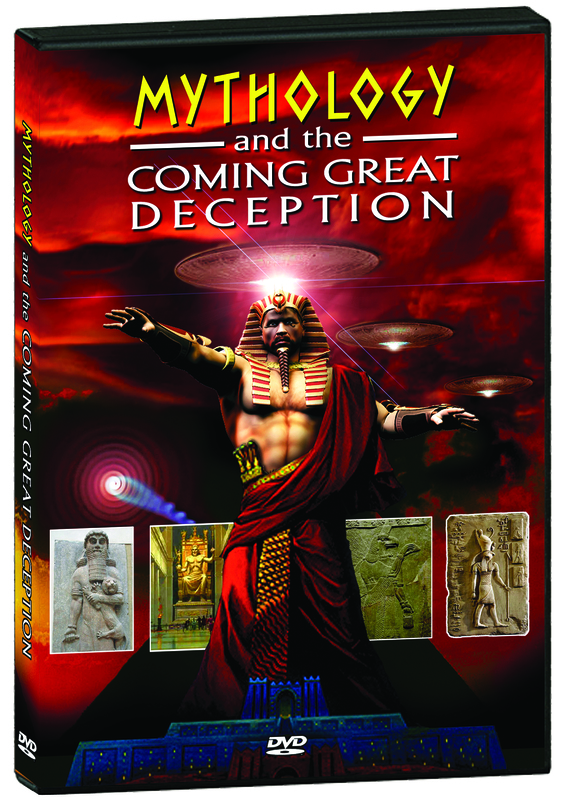 In The Genesis 14 War, we are dealing exclusively with the grandchildren of Noah - specifically the offspring of Canaan (and in the case of Nimrod/Amraphel, the offspring of Cush). With Chedorlaomer the king of Elam, and with Tidal king of nations, and Amraphel king of Shinar, and Arioch king of Ellasar; four kings with five. And the vale of Siddim was full of slimepits; and the kings of Sodom and Gomorrah fled, and fell there; and they that remained fled to the mountain. 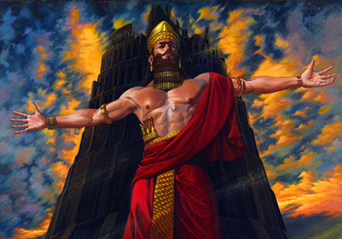 concerning the Raphaims: the word "raphaim" is used at least 25 times as a reference to giants in the Old Testament. Note here that the Raphaim giants of Ammon were reckoned as having formerly dwelt there. The King James Version says, "That also was accounted a land of giants: giants dwelt therein in old time." So, this shows that those giants have been around for a while: since the "old times." Moses wrote that toward the end of the wandering in the wilderness after their Exodus from Egypt. That was only 850 years after the Flood. Moses is looking back on those "old days" and telling us how long these giants have been around. This passage is also very interesting in that it shows a series of dispossession. The Zamzummim were great and many and as tall as the Anakim, but the Anakim had previously been taken out by God Himself some time prior. The Zamzummin replaced the Anakim (who were Amorites). Next we see that God helped out the children of Esau just as He did the sons of Jacob. God destroyed the Horites and the sons of Esau settled in their place. And finally, we see that the Caphtorim (who themselves may have been giants), came from Crete, destroyed the Avim and settled in their place. Note the repeated references to Anak, the son of Arba in these texts. Hold that thought. We'll come back to this interesting family shortly. Just remember that they were extremely tall and very numerous in the land! The Emims dwelt therein in times past, a people great, and many, and tall, as the Anakims; Which also were accounted giants, as the Anakims; but the Moabites called them Emims. But as my people watched, I destroyed the Amorites, though they were as tall as cedars and as strong as oaks. I destroyed the fruit on their branches and dug out their roots. These kings had laid waste all Syria, and overthrown the offspring of the giants. And when they were come over against Sodom, they pitched their camp at the vale called the Slime Pits, for at that time there were pits in that place; but now, upon the destruction of the city of Sodom, that vale became the Lake Asphaltites, as it is called. The children of Ham possessed the land from Syria and Amanus, and the mountains of Libanus; seizing upon all that was on its sea-coasts, and as far as the ocean, and keeping it as their own. This is also reflected in Genesis 14:5 where Moses writes, "the Zuzims in Ham." So here we are just 450 years after the Flood and about 350 years or so after the Tower of Babel and we see all out warfare between the sons of men and the offspring of giants! We've just seen repeated statements of massive giants who were great and many and as tall as the Anakim. The Anakim were sons of Anak, who was a son of Arba, who was a (distant?) son of Amorreus, who was a son of Canaan. I believe that God was using his prophet Moses to put very specific names into his chronology in order to help us clearly see what was going on in the land of Canaan. We know that our faith was built upon the faith of our fathers, Abraham, Isaac and Jacob. The sons of Jacob, later became the children (the 12 tribes) of Israel. 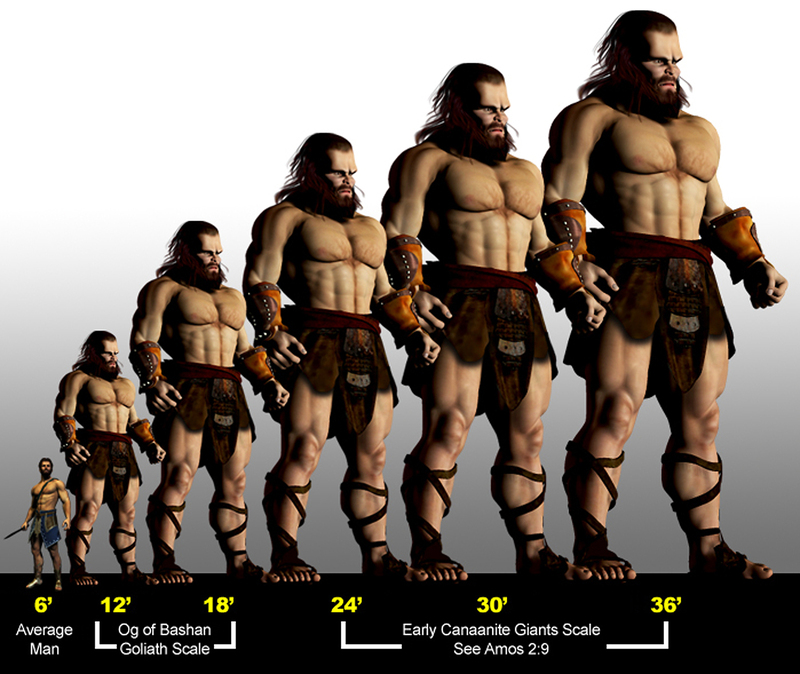 Looking at Genesis 12 - 15, we can see an interesting paralleled chronology of giants. In Genesis 15, Moses tells us about God's covenant with Abraham. And when the sun was going down, a deep sleep fell upon Abram; and, lo, an horror of great darkness fell upon him. And he said unto Abram, Know of a surety that thy seed shall be a stranger in a land that is not theirs, and shall serve them; and they shall afflict them four hundred years; And also that nation, whom they shall serve, will I judge: and afterward shall they come out with great substance. And thou shalt go to thy fathers in peace; thou shalt be buried in a good old age. But in the fourth generation they shall come hither again: for the iniquity of the Amorites is not yet full. And it came to pass, that, when the sun went down, and it was dark, behold a smoking furnace, and a burning lamp that passed between those pieces. In the same day the LORD made a covenant with Abram, saying, Unto thy seed have I given this land, from the river of Egypt unto the great river, the river Euphrates: The Kenites, and the Kenizzites, and the Kadmonites, And the Hittites, and the Perizzites, and the Rephaims, And the Amorites, and the Canaanites, and the Girgashites, and the Jebusites. Indeed they have! Do those other seven tribal names sound familiar? Here God is telling Abram that He is going to give him the land of the giants - but only after four generations of them have had time to reproduce. I believe that is what is being referred to when God says, "for the iniquity of the Amorites is not yet full." What is this "iniquity" that needs to become full? 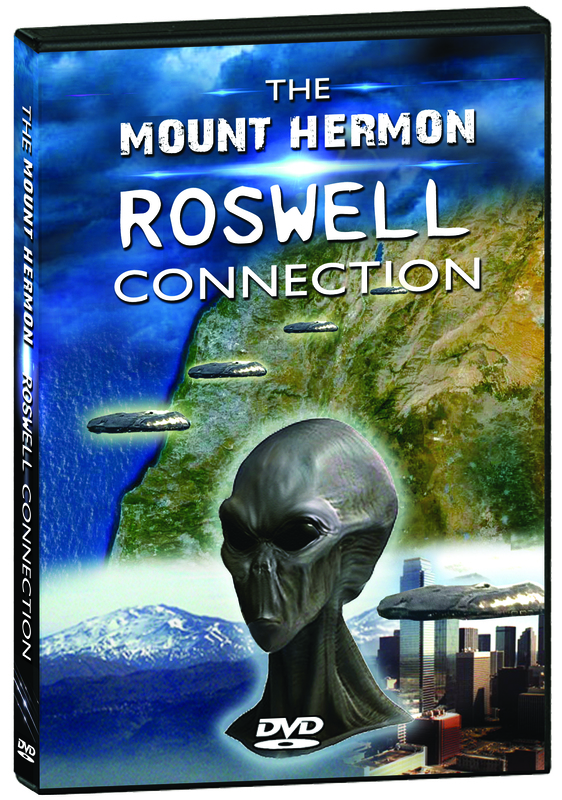 I believe it is the spreading of Nephilim seed for four generations. Some would suggest that the four generations referred to in this passage are of Abraham's seed. The problem I have with that idea is that it will be another seven generations before anyone returns to the land of promise after their time of slavery. Therefore, I am thinking that the four generations has more to do with the seed of the Amorites than the seed of Abraham. The question, "Who was Arba?" has come up in more than a few debates that I've had with my peers concerning the Post-Flood giants. I suspect that he was a contemporary of Abraham's. This giant is clearly a significant figure in that he is the father of Anak, from whom came the Anakim, which are the giants so many are referred to and compared with in the land of Canaan. 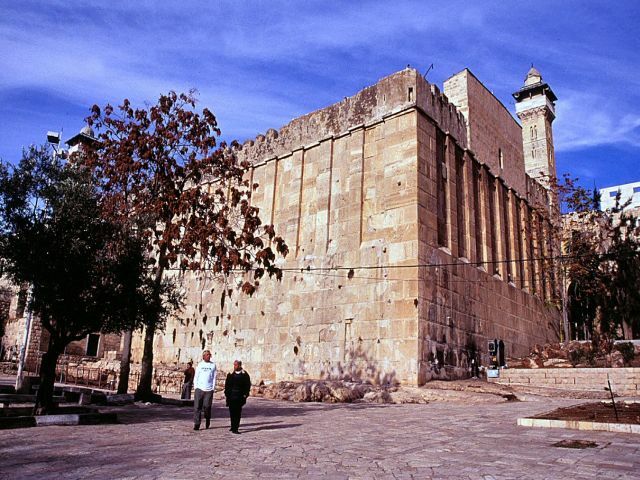 Sarah died in Kiriath-arba (that is, Hebron) in the land of Canaan; and Abraham went in to mourn for Sarah and to weep for her. ar'-ba ('arba`, "four"): Variously described as "the greatest man among the Anakim" (Joshua 14:15), "the father of Anak" (Joshua 15:13), "the father of Anak" (Joshua 21:11 margin). Thus he seems to have been regarded as the ancestor of the Anakim, and as the most famous hero of that race. He was the reputed founder of the city called after him, on the site of which Hebron was built (Joshua 21:11). And the name of Hebron before was Kirjath-arba - That is, the city of Arba, or rather, the city of the four, for thus עברא תירק kiryath arba may be literally translated. It is very likely that this city had its name from four Anakim, gigantic or powerful men, probably brothers, who built or conquered it. This conjecture receives considerable strength from Joshua 15:14, where it is said that Caleb drove from Hebron the three sons of Anak, Sheshai, Ahiman, and Talmai: now it is quite possible that Hebron had its former name, Kirjath-arba, the city of the four, from these three sons and their father, who, being men of uncommon stature or abilities, had rendered themselves famous by acts proportioned to their strength and influence in the country. It appears however from Joshua 15:13 that Arba was a proper name, as there he is called the father of Anak. The Amorite - These, as one of the mightiest of the Canaanite tribes, stand in Moses for all. Moses, in rehearsing to them the goodness of God and their backsliding, reminds them, how he had said, "Ye have come to the mountain of the Amorites, which the Lord your God giveth you" Deuteronomy 1:20; and that they, using this same word, said, "Because the Lord hateth us, He hath brought us forth out of the land of Egypt, to give us into the hand of the Amorite to destroy us" Deuteronomy 1:27. The aged Joshua, in rehearsing God's great deeds for Israel, places first by itself the destruction of the Amorite before them, with the use of this same idiom , "I brought you into the land of the Amorites which dwelt on the other side of Jordan - and I destroyed them before you." The Amorites were descended from the 4th son of Canaan Genesis 10:16. At the invasion of Chedorlaomer, a portion of them [the Amorites] dwelt at Hazezon-Tamar or Engedi, half way on the west side of the Dead Sea, and at Hebron near it (Genesis 14:7, Genesis 14:13; compare Genesis 13:18; 2 Chronicles 20:2). Their corruption had not yet reached its height, and the return of Israel was delayed to the four hundredth year, "because the iniquity of the Amorite was not yet full" Genesis 15:16. When Israel returned, the Amorites, (together with the Hittites and the Jebusites) held the hill country Numbers 13:29; Deuteronomy 1:7, Deuteronomy 1:44, Jerusalem, Hebron, Gibeon 2 Samuel 21:2, and, on the skirts of the mountains westward Jarmuth, Lachish, and Eglon Joshua 10:3, Joshua 10:5. They dwelt on the side of the Jordan westward Joshua 5:1, besides the two kingdoms which they had formed east of Jordan, reaching to Mount Hermon Deuteronomy 3:8 and Bashan up to the territory of Damascus. Afterward a small remnant remained only in the portion of Dan, and in the outskirts of Judah, from the south of the Dead Sea, Maaleh Akrabbim (Scorpion-pass) and Petra Judges 1:35-36. Those near Idumea were probably absorbed in Edom; and the remnant in Dan, after becoming tributary to Ephraim Judges 1:35-36, lost their national existence perhaps among the Philistines, since we have thenceforth only the single notice in the days of Samuel after the defeat of the Philistines, "there was peace between Israel and the Amorites" 1 Samuel 7:14. Whose height was like the height of the cedars - The giant sons of Anak were among the Amorites at "Hebron" Numbers 13:22 (called for a time Kiriath Arba Joshua 14:15; Joshua 15:13-14 from their giant father) "Debir, Ahab, and the mountains of Judah and Israel Joshua 11:21. 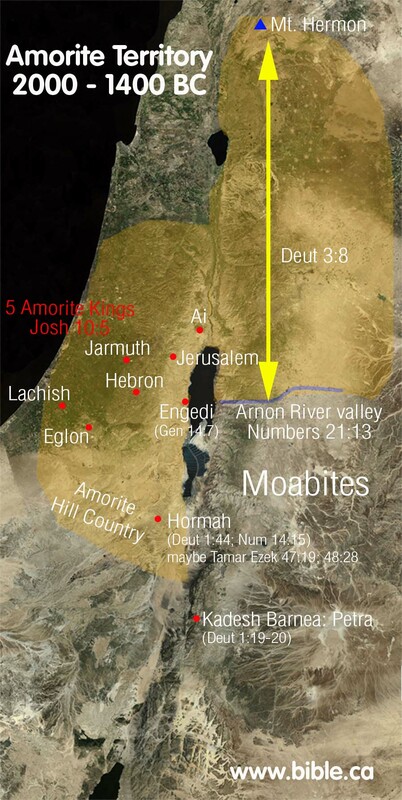 The valley of Rephaim" 2 Samuel 5:18, southwest of Jerusalem, connects this giant race with the Amorites, as does the fact that Og, king of the Amorites in Basan, was "of the remnant of the Rephaim" Deuteronomy 3:11; Joshua 12:4; Joshua 13:19. Basan and Argob were, in Moses' time, still called "the land of Rephaim" Deuteronomy 3:13. The Rephaim, with the Perizzites, dwelt still in woody mountains near Ephraim; from where, on the complaint that the lot of the sons of Joseph was too narrow, Joshua bade his tribe to expel them Joshua 17:15, Joshua 17:18. The Rephaim are mentioned between the Perizzites and the Amorites Genesis 15:20-21, in God's first promise of the land to Abraham's seed, and perhaps some intermixture of race gave the giant stature to the Amorites. It is clear from Amos that the report of the spies, "all the people that we saw in it were men of stature" Numbers 13:32, was no exaggeration, nor did Joshua and Caleb deny "this." The name of the Amorite is probably connected with "commanding," describing some quality of their forefather, which descended to his race. Whose height was like the height of cedars - Giant height is sometimes a cause of weakness. Amos, in a degree like Hosea combines distinct images to make up the idea of stateliness and strength. The cedar is the ideal of eastern trees for height Isaiah 2:13; Ezekiel 17:22; Ezekiel 31:3; 1 Kings 4:33; 2 Kings 14:9, stretching forth its arms as for protection , "It groweth to an exceeding height, and with increasing time ever riseth higher." The oak has its Hebrew name from strength. The more majestic the tall strength of the Amorite, the more manifest that Israel "got not the land in possession by their own sword" Psalm 44:3, who had counted themselves, in sight of the Amorite, "as grasshoppers" Numbers 13:33. God, who gave him that strength, took it away, as we say, "root and branch," leaving him no show above, no hope of recovered life below (see Hosea 9:16; Job 18:16; Ezekiel 17:9). Having compared each Amorite to a majestic tree, he compares the excision of the whole nation to the cutting down of that one tree , so swift, so entire, so irrecoverable. Yet the destruction of the Amorite, a mercy to Israel in the purpose of God, was a warning to israel when it became as they. God's terrors are mercies to the repentant; God's mercies are terrors to the impenitent. "Ye shall keep My statutes and My judgments and shall not commit any of these abominations," was the tenure upon which they held the Lord's land, "that the land spue not you out also, when ye defile it, as it spued out the nations that were before you" Leviticus 18:26, 38. And there we saw the Nephilim, the sons of Anak, who come of the Nephilim: and we were in our own sight as grasshoppers, and so we were in their sight. The first thing we MUST acknowledge is that Moses wrote that the Nephilim they encountered in the land of Canaan were giants who came from (or of) Nephilim giants. Again, there is absolutely NO mention of Fallen Angels mating with women to produce the giants that they saw, roughly 850+ years after the Flood. 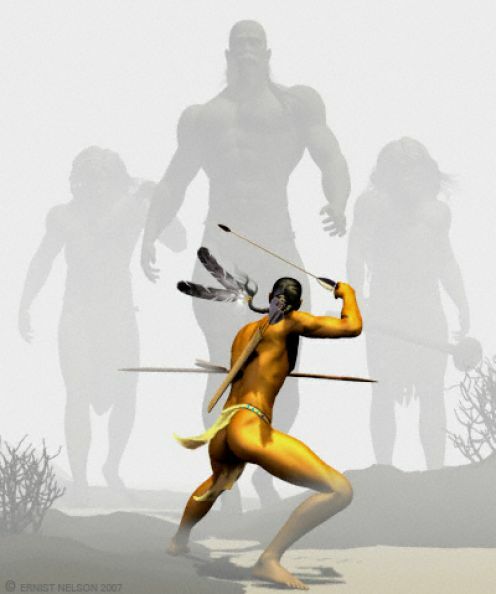 These Nephilim giants were the sons of another Nephilim giant named Anak. Amorreus The father of the Amorites was a son of Canaan and thus a contemporary cousin of Nimrod, Caphtor and Shem's grandson, Selah. That places his birth sometime between 35 and 70 years after the Flood. Arba: As an Amorite and a contemporary of Abraham, Arba would have been born sometime between 150 and 350 years after the Flood. Anak: Arba had a son named Anak who must have been born sometime prior to Joseph being sold into slavery or the house of Jacob going down to Egypt. His descendants filled the land of Canaan while the Israelites were in Egypt. Sons of Anak: Immediately following the Exodus from Egypt, the Hebrew spies described the sons of Anak as being so big that they felt like grasshoppers by comparison. If the sons of Anak, who was a son of Arba were that big, those genes must have been passed down from their great grand dad, Amorreus who was a direct decendant of Canaan! We can not know for certain when Arba was born because the Scriptures are silent. He lived at a time when normal humans were living between 200+ (Terah's generation) and 438+ years (Canaan/Arphaxad's generation). 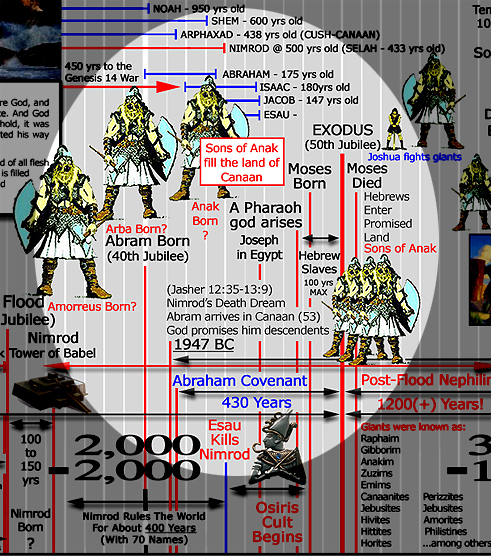 Looking at the timelines above, and based on what we've learned so far, it would seem to be a safe conclusion to suggest that Abraham and the kings of The Genesis 14 War may have been fighting against either the forces of Arba or of one of his immediate ancestors. Whether that's true or not, one thing we know for sure is that Arba had to have been around at the time of or prior to the time of Abraham in order to have had a city named after him by the time of Sarah's death. 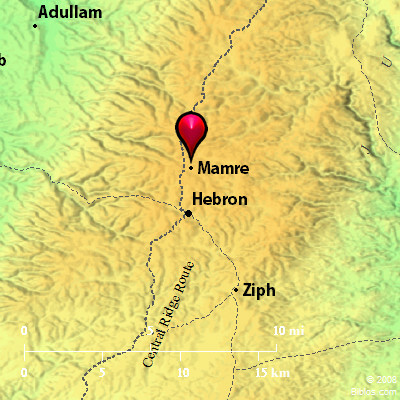 Previously, that area had been known as Hebron and specifically, the area of the oaks of Mamre. Mamre, interestingly enough appears to have been a "good Amorite." 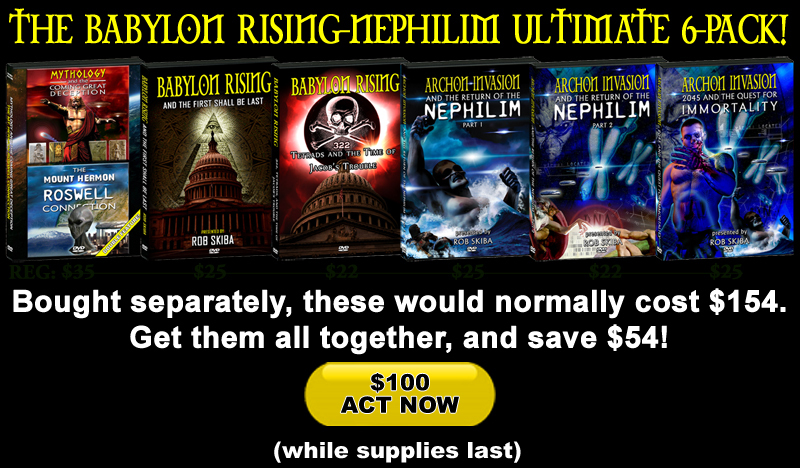 If so, this is the first time I've seen any Nephilim offspring that was good by any standard. Or maybe that's jumping to conclusions? At best, we know from Scripture that he and his brothers were concidered by Abram to be allies. At some point around that time or shortly thereafter, Arba (who may have been a close relative of Mamre) had a son named Anak, who must have been known to the sons of Abraham as they would have been contemporaries. In fact, if this timeline is accurate, it would appear that there is a direct parallel between the sons of Anak who were of Nephilim seed and the sons of Jacob who were of Abraham's seed. The race for whose sons would occupy the Promised Land was on! And the parallels are uncanny. But this helps to explain how the Hebrew spies (who were of the generation of Jacob's great, great, great grandchildren) knew who those giants were when they saw them in the land! They probably heard the stories passed down from their fathers before them. As we saw in the Multiple Incursions? blog, the giants the Hebrew spies saw must have been upwards of 30 feet tall or more in order for them to have felt like "grasshoppers" by comparison. Notice too that these grapes came from the brook (or valley) of Eschcol. Eschol was a brother of Mamre - the Amorite. None of this is by accident. It's not mere coincidence that God gives us these details to consider. He is showing us connection after connection, helping us to see the "bigger" picture. As I began to realize this, I took a closer look at the grapes. As I did, I saw that the grapes actually confirmed the size of the giants who were eating them! The Hebrew spies identified them as the sons of Anak. How did they know who they were? Obviously, there had to have been some memory of Anak in their minds from times past. That would lead us to believe that either Isaac's or Jacob's generation knew who Anak was. And as we've seen above, it is easy to see how this could be true. But notice how that Amos passage says that God destroyed the Amorites before them. What's that all about? If we imagine the giants that the Israelite spies saw as being 36 foot small cedar trees, and these being great, great, great grandsons of Anak, could the previous generations have been even bigger? Maybe. But let's just stick with the 36 footers for now. That's a serious foe! And to look at the scaled representation to the right, it is very easy to understand why the spies gave a "bad report." But for Caleb to have had the faith to say what he said is extraordinary! But the men that went up with him said, We be not able to go up against the people; for they are stronger than we. And they brought up an evil report of the land which they had searched unto the children of Israel, saying, The land, through which we have gone to search it, is a land that eateth up the inhabitants thereof; and all the people that we saw in it are men of a great stature. And there we saw the giants, the sons of Anak, which come of the giants: and we were in our own sight as grasshoppers, and so we were in their sight. Caleb had some serious faith!!! Or perhaps he understood the deeper meaning contained in the list of names that he was apart of. Remember, names mean things in the Bible! So, let's look at the name list for the Hebrew spies given in the Scriptures. That list can be found in Numbers 13:4-16. Nu 13:4 See a Son! Listen and Remember! Nu 13:5 Listen to my noble judge. Nu 13:6 He shall be praised whole-heartedly. He will be prepared. Nu 13:7 He will bring a reward, and he will redeem. Let Him increase (Jehovah). Nu 13:8 For he shall be doubly fruitful to save for eternity. Nu 13:9 Son of my right hand, He will escape and be healed. Nu 13:10 Dwelling in God - His fortune, my confidant. Nu 13:13 happy and hidden. Who is as God? Nu 13:14 My wrestling. My hiding. Where have you vanished? Nu 13:15 My fortune is to exalt God in my poverty. Did Caleb know this? Had he reasoned this out as he left to spy out the land? I don't know. But I do find that list to be quite interesting and prophetic! Regardless, Caleb had the faith to take the giants out and possess the promises of God. May we have that same kind of faith and confidence in the God we serve! I used to think that Numbers 13:33 was the first mention of Post-Flood Nephilim. But as we can now see, there is a well documented stream of giants producing giants starting almost immediately after the Flood and continuing all the way up to when the Israelites returned to the land of Canaan - after the time of "the iniquity" of the four generations of Amorites was complete. Thus, from within a hundred years after the Flood (as in Nimrod and Amorreus) all the way up until this Numbers 13 account following the Israelite Exodus from Egypt we can see a solid 850 to 900 years worth of trackable giant lineage. That is a well documented, Biblically supported fact! And as we will soon see, this "generational linking" continued all the way up to the time of David. Because the people lacked the faith of Caleb, and did not believe that God would deliver these giants into their hand, the Israelites were made to wander in the wilderness for 40 years until that entire generation died off. By the time they were ready to go back into the land Caleb and Joshua were pushing close to 80 years of age. But when they engaged some of the Amorite kings, namely the King of Sihon and Og of Bashan, the giants they encountered were about half the size of those they encountered 40 years prior! What happened? 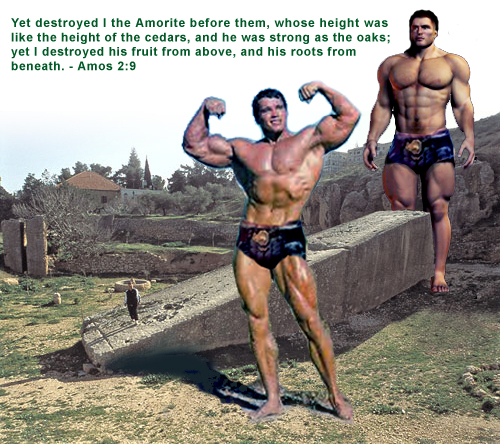 I destroyed the Amorites in front of them, although the Amorites were as tall as cedars and as strong as oaks. I destroyed their fruit above the ground and their roots below it. And the LORD said unto Moses, Depart, and go up hence, thou and the people which thou hast brought up out of the land of Egypt, unto the land which I sware unto Abraham, to Isaac, and to Jacob, saying, Unto thy seed will I give it: And I will send an angel before thee; and I will drive out the Canaanite, the Amorite, and the Hittite, and the Perizzite, the Hivite, and the Jebusite: Unto a land flowing with milk and honey: for I will not go up in the midst of thee; for thou art a stiffnecked people: lest I consume thee in the way. "When the LORD your God brings you into the land where you are entering to possess it, and clears away many nations before you, the Hittites and the Girgashites and the Amorites and the Canaanites and the Perizzites and the Hivites and the Jebusites, seven nations greater and stronger than you, and when the LORD your God delivers them before you and you defeat them, then you shall utterly destroy them. You shall make no covenant with them and show no favor to them. It appears that God, although sick and tired of dealing with this "stiffnecked people" still gave them some advantage going into the land. They obviously lacked the faith to go up against 30+ footers. So, it looks like God pounded the big ones out and left the small ones - the 15 to 18 footers - for those who had the faith of Joshua and Caleb to take out. And that's exactly what they did! Remember, God had promised Abraham that he would be given the land of the Kenites, Kenizzites, Kadmonites, Hittites, Perizzites, Rephaim, Amorites, Canaanites, Girgashites, and the Jebusites (Genesis 15:17-21). God appears to have wiped out most of the Amorites. Then, among the problematic tribes that remained, there are essentially six core people groups mentioned in the Old Testament: the Hittites, Perizzites, Ammonites, Hivites, Canaanites, and Jebusites. These six are listed in: Exodus 3:8&17, 13:5 (omits Perizzites), 23:23, 33:2, and 34:11, Deuteronomy 20:17, Joshua 9:1, 12:8, and Judges 3:5. There is one shorter list consisting of: the Hittites, Canaanites & Hivites only in Exodus 23:28. And some of the lists add the Girgashites to the above mentioned six as in: Deuteronomy 7:1, Joshuah 3:10, 24:11, Nehemiah 9:8 (who omits Hivites). So clearly, they still had quite a lot to do! There was none of the Anakim left in the land of the children of Israel: only in Gaza, in Gath, and in Ashdod, any remained. 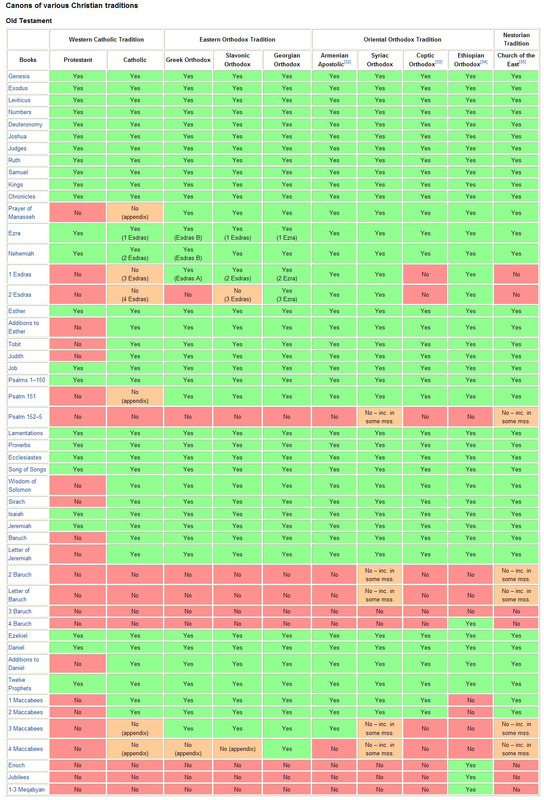 And for the better part of the next 400 years or so, these remaining false god worshipping giants would pose a constant threat and prove to be very problematic for the children of Israel - especially the Philistines (who were descendants of Mitraim's son Caphtor from Crete). These giants and their offspring were mentioned even more times in the Bible than the Amorites. They became one of Israel's primary enemies with about 270 references in the Bible. They were a constant proplem for God's chosen people. But then along came a shepherd boy, filled with the Holy Spirit and the fire of God running through his veins! A champion named Goliath, who was from Gath, came out of the Philistine camp. He was over nine feet tall. Your servant has struck down both lions and bears, and this uncircumcised Philistine shall be like one of them, for he has defied the armies of the living God. Now after this it came about that David defeated the Philistines and subdued them and took Gath and its towns from the hand of the Philistines. And it came to pass after this, that there arose war at Gezer with the Philistines; at which time Sibbechai the Hushathite slew Sippai, that was of the children of the giant: and they were subdued. And there was war again with the Philistines; and Elhanan the son of Jair slew Lahmi the brother of Goliath the Gittite, whose spear staff was like a weaver's beam. And yet again there was war at Gath, where was a man of great stature, whose fingers and toes were four and twenty, six on each hand, and six on each foot and he also was the son of the giant. But when he defied Israel, Jonathan the son of Shimea David's brother slew him. These were born unto the giant in Gath; and they fell by the hand of David, and by the hand of his servants. Uzziah declared war on the Philistines and broke down the walls of Gath, Jabneh, and Ashdod. Then he built new towns in the Ashdod area and in other parts of Philistia. He also conquered the Philistines as far distant as Gaza and its territory, from their smallest outpost to their largest walled city. Regarding the latter two accounts, we don't see mention of giants amongst the Philistines. It would seem that David and his mighty men took out the last of them in the land. 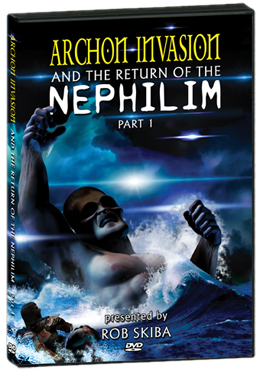 As you can see, the Bible gives us a great deal of information concerning the Return of the Nephilim: AFTER the Flood. But what it does not give us is any detail whatsoever concerning angels ever again mating with women to produce these giants. Not one single Scripture reference! Whereas, we have an abundance of Scriptures referring to the offspring of the sons of Ham, beginning very soon after the Flood and continuing on for just over 1200 years to the time of David. In every single case, the Bible refers to the Post-Flood giants as the offspring of previous giants... and not Fallen Angels or Watchers. The "Multiple Incursions" theory is therefore completely un-Biblical and totally unnecessary to explain the Post-Flood giants! Were you blessed by this information? If so, please consider contributing toward our on-going research efforts. Of course, there is no pressure, but for those so inclined to give, your support is greatly appreciated. We are only able to do this sort of thing for free because of the faithful support of people like you. Click on the pics to enlarge and learn more. Click on the BUY NOW buttons to purchase. E-mail us for bulk discount and wholesale rates. Get both together and save $7! Uncontrolled as water, you shall not have preeminence, Because you went up to your father's bed; Then you defiled it-- he went up to my couch. 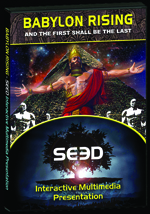 This e-book series is designed to explore many of the themes, concepts and ideas that will be in our forthcoming sci-fi series SEED. Thus, you might think of it as the non-fiction behind the fiction. To navagate this series, use the slide-out BLOG MENU to the left. Keep in mind that this is a work in progress. As such, each blog (chapter) is subject to change, modification and in some cases a complete re-write as I receive feedback, criticism and new revelation in my research. When I am fairly satisfied with what I have written, I will record myself reading the blog for your benefit. Whenever audio is available, you can listen as you read by clicking on the embedded audio player below each blog's title or by clicking here to bring up the all in one audio player. If I have not recorded a particular blog in audio format, it probably means I am not finished writing and/or editing it. When I feel it is ready, I will record it on my supplemental radio show, The Revolutionary Radio Project on BlogTalkRadio.com. If you find this information helpful and interesting, please click on the "SHOW SEED" button to the right. That will take you to a page that will enable you to show your support for this effort by filling out a short and simple form that will help us gauge the level of public interest. Doing so will give us a valuable tool as we approach investors to get this project off the ground. 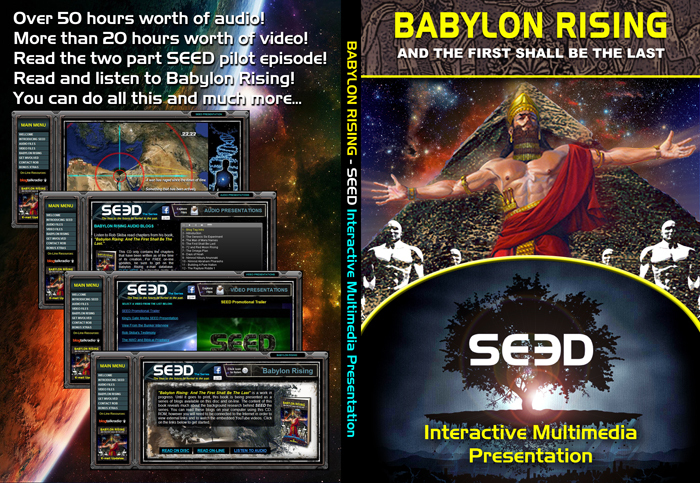 It will also put you on our mailing list for future Babylon Rising blog updates. This way you can know when a new blog has been posted (or an old one has been modified). You can also check out our SEED promotional page to have another resource for posting on Facebook and other social networking sites. Your support is greatly appreciated! 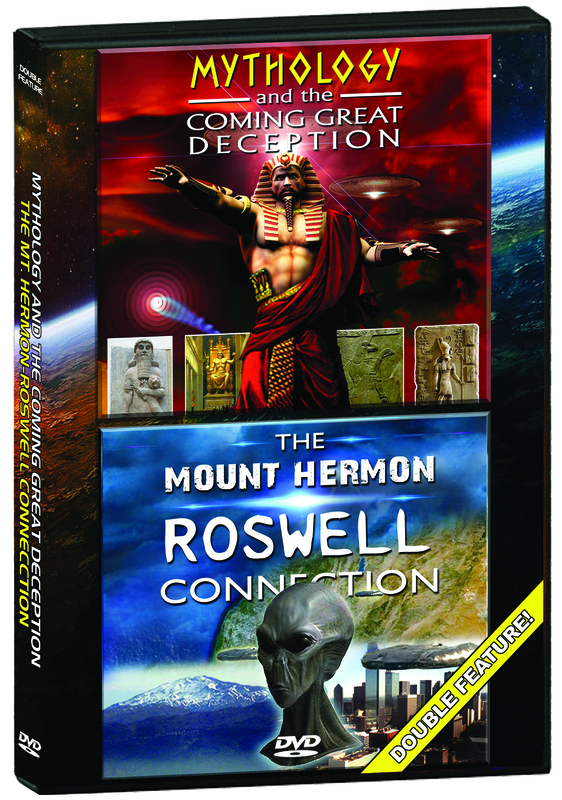 This work represents some of my research, thoughts and ideas regarding history and the End Times. Do not take anything I write as the "Gospel Truth." I encourage you to be a “good Berean” and study these things out for yourself to come to your own conclusions. DISCLAIMER: While I do believe that the books contained in The Holy Bible were Divinely inspired and written by men, I do not necessarily hold to the idea that only the 66 books we now have in our (Protestant) Bibles are the sole Divinely inspired books of antiquity. For instance, the King James Version (on which I was raised) used to have 80 books in it. Today, we only have 66. Many editions of the Bible throughout the centuries contained or left out different books. God will not contradict Himself. Therefore, the fact that there have been so many different "canons" of Scripture over the centuries proves to me that the acquisition and accumulation of Scripture has not always been Divinely inspired. I also do not believe that any one version of our English Bible is 100% correct and accurate in its TRANSLATION. Granted, some are better than others. But Hebrew, Greek and Aramaic are all very complex languages and it is often hard for English as a language to do the text justice. Thus, I find that comparing different English translations can help show us a variety of ways of looking at what was originally written. I am mentioning this because throughout this series of blogs I will be referencing different versions of English Bibles as well as taking a look at some of the books not currently considered "canon" in our (Protestant) Bibles. Having grown up in a "KJV only" environment, I felt the need to say this up front. I pray that does not hinder you in any way and that this series of blogs is interesting, enlightening and encouraging to you. Were you blessed by this information? If so, would you please consider making a contribution to our ministry?